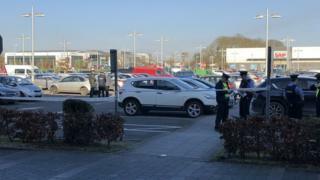 A man in his 30s is being treated in hospital for serious injuries after a shooting at the M1 Retail Park in Drogheda, County Louth. Irish broadcaster RTÉ said the man sustained a gunshot wound to the neck during the incident, which happened at 14:45 local time. The man, who was a passenger in a white Vauxhall Astra car, was struck at least once. The other two occupants were not injured. Gardaí (Irish police) said a black Volkswagen Passat with a partial 132-D registration had pulled up close to the Astra and a number of shots were fired into it. The driver of the white Astra drove the vehicle to Our Lady of Lourdes Hospital where the injured man is being treated for serious injuries. The black Volkswagen Passat also left the scene and this car has not yet been located. Gardaí have sealed off two crime scenes and a technical examination is under way at the M1 Retail Park and at Our Lady of Lourdes Hospital where the white Astra is located. They have appealed for information about the shooting.